Australian business banking customers have reached their highest level of satisfaction in a Roy Morgan survey since it began four years ago. 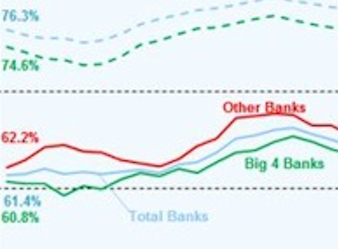 But the big four banks are trailing behind their smaller counterparts in the satisfaction rankings. The 12,000 business decision-makers surveyed for Roy Morgan’s Business Banking Satisfaction Report 2014 reported being 70% satisfied with their banks, on average. But all four big banks fell below this level with satisfaction sitting at less than 68%. The other smaller banks had an average satisfaction level of 72%. Of the big four, Westpac business customers had the highest satisfaction level over the last three years. They also showed the greatest improvement in satisfaction, up nearly 10 percentage points over the last four years. Despite improvements, banks’ business customer satisfaction levels still remain well below that of personal customers; more than 12% lower. For both consumers and businesses, banks outside the top four are the clear leaders in satisfaction. Over the last four years the smaller banks have maintained a marginal lead in satisfaction among consumers, but the gap has generally been closer for business customers. “The big four banks have generally focused on how they rate against each other but this analysis shows the need for more focus on how they compare with the other banks”, says Roy Morgan Research industry communications director Norman Morris. Banks have been making a “concerted effort to improve customer satisfaction”, resulting in considerable gains over a number of years, and the focus needs to be on “closing the gap” between business and personal customers, Morris said.